A great way to fight off oral thrush is using apple cider vinegar. It’s cheap and easily available, so you shouldn’t have any problem finding it – and it’s great against candida, too! However, its taste may be a bit unpleasant, so you need to find a way to adjust to that. It may also be advisable to include other antifungals in your treatment, too, so that you’ll cure your infection more effectively. Apple cider vinegar has enzymes that work against the candida infection, while also balancing the PH levels in your body. Additionally, apple cider vinegar has been shown to help boost your immunity, which is great for preventing further candida infections. 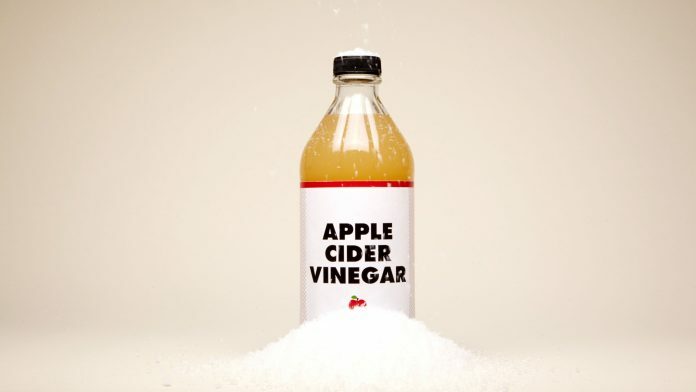 There’s more than just one way to take apple cider vinegar. Mouthwash: Add two teaspoons of vinegar to two teaspoons of water, and use the resulting solution to gargle with two times a day, for about 1 minute each time. Mocktail: This recipe works great against thrush, and it’s also a much more palatable way of getting some apple cider vinegar into your system. If you don’t overtake it, apple cider vinegar should be safe for most people. However, ingesting too much may cause slow digestion, sore throats, tooth enamel damage, and high blood pressure. There’s also some evidence which shows that, if you suffer from diabetes – which is always a possibility, if you’ve got oral thrush – apple cider vinegar may dangerously reduce blood sugar levels. Apple cider vinegar is an effective antifungal. Taken as such or used to mouthwash, it will reduce the candida colonies in your mouth, thus speeding up the healing process.